Latest review. Site reviews books available on Kindle. New Orleans Book Festival at the Auduban Zoo in New Orleans on March 19th. I will be there with Capt. John Swallow and Captain Wendy Billiot from Bayou Dularge who will be signing copies of her book Before The Saltwater Came. There will be a lot going on and it will coincide with NOLA Pyrate Week. The real pirates! Result of pirate poll. The poll is closed. 16 votes were cast. First of all, thanks to all who voted and those who visited the site. There were no votes for Captain Crunch, Captain Hook, and Jack Sparrow. Congratulations, those fooled no one. Almost all voted for Blackbeard (15) and Jean Lafitte (15). Again, congratulations, you were correct. Most voted for Captain Kidd (10) and Henry Morgan (13) and were right to do so. Most didn't realize that Thomas Tew (4) and Red Beard (4) were real pirates. Five of the pirates listed were fictional. Now to the real pirates! Blackbeard was an English pirate also known as Edward Teach or Thatch. His ship was the Queen Anne's Revenge and he mainly operated in the Caribbean in the early 1700s. He was killed in 1718. His legend grew after his death. Red Beard also known as Barbarossa. This one was tricky. He is very obscure, a Turkish pirate. He plagued the Barbary Coast in the early 1500's. Known for his red beard. Captain Kidd, probably the most famous pirate along with Blackbeard. William Kidd was Scotish. Sailed during the late 1600's. He was tried for piracy and executed. He was hung in 1701. There is probably more information on him than any other pirate out there. Calico Jack, his given name was John Rackham. He was an English pirate who based his operations in the Caribbean in the early 1700's. He sailed with 2 female pirates. His design of the pirate flag is the one many recognize, the skull with 2 crossed swords. He was hung for piracy in Jamaica in November of 1720. He was a very interesting pirate and there is more information available on him and his female companions in books and articles. Thomas Tew was an English pirate. He was supposed to have been married with children. He supposedly was shot by a cannon and killed near the Red Sea in 1695. Henry Morgan, a Welsh pirate, was an Admiral. This is not the Captain Morgan from the Rum commercials. I almost put him in the poll but did not want to confuse the voters. Henry Morgan was noterious and active in the mid to late 1600's. He is considered one of the most successful pirates. He actually retired from piracy and died from, probably, tuberculosis or maybe from liver failure due to his heavy drinking. He died in 1688. Black Bart was also a Welsh pirate. His name was John Roberts. He supposedly preferred tea to rum, suprising for a pirate! He is considered the most successful pirate ever. He operated off the coast of Africa and the coast of America. He was killed in battle. His body was weighted and he was buried at sea. He died on 10 February 1722 and that date is known as The Blackest Day, the day the Golden Age of Piracy ended. Jean Lafitte, of French origin, operated in the Gulf of Mexico during the early 1800's. Based his operations off the coast of Louisiana then moved to Galveston, Texas at the end of his career. Hero of the Battle of New Orleans. Previous posts on this site has much more information on him as well as his brother and crew. I hope this sparked some interest. You Gotta Read Videos: November 2010 Entry #14 Lafitte's Black Box: "Title: Lafitte's Black Box Author: Jake Webber Trailer Creator: Jake Webber Blurb: When he can no longer control what is real and wh..."
Pirate Alley is a small block located in the French Quarter between Chartres Street and to Royal Street. The street of the same name, Pirate Alley, runs between the two. Jackson Square is at the entrance at Chartres Street and the alley is sandwiched between St. Louis Cathedral and the Cabildo. It is one of the most visited spots in New Orleans. Many people like to get their photograph at the famous lamppost that marks the entrance. 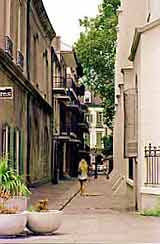 It was originally called Orleans Alley or Orleans Alley South. The name was officially changed to what it had been commonly called by locals to Pirate Alley in 1964. Pirate Alley has been the meeting place of politicians, smugglers, pirates, theives, poets, writers, businessmen, lovers, etc. It has been painted, photographed, and drawn many times over. Jean Lafitte was jailed here...and escaped. Others were jailed here as well as this was the location of a Spanish prison. The street is narrow, as was common during the time and cobblestoned. There is an air of mystery and intrigue to the place due to its history and the usual feel of what the French Quarter has captured, collected, and made its own through the ages. The Faulkner House is located here. William Faulkner wrote his first novel there. The house has been restored and is now the location of the Faulkner Society. The first floor is the location of Faulkner House Books. This is a great area to visit and explore. Here's a link to an interview I did on the website, The Indie Spotlight. Which of the following pirates were real pirates? Any publication of material must have written consent of owner.